Citation: Aruna Nigam, Anupam Prakash, Pikee Saxena, Archana Mishra. Skin Rash in Pregnancy. Journal, Indian Academy of Clinical Medicine Vol. 11, No. 3 July-September, 2010. The case we present here discusses physiological changes characterized by hyper-pigmentation all over the body. A 25 year old woman, 38 weeks pregnant with her 3rd child, had been experiencing labour pains for 8 hours, after which she was taken to the emergency. It was found that both of her previous pregnancies had been uneventful. After examining her body, doctors found multiple papular lesions with scaly appearance and hyper-pigmentation all over her body, including the neck, hands, legs, genitalia, face, scalp, forehead and trunk. There was painless enlargement of lymph nodes all over her body. She had an abdominal lump too, which was consistent throughout her pregnancy. The rest of her body examination was fine. After further investigation, doctors found that she had had the skin rash for the past 2 months. As there were no symptoms, the patient did not feel worried about it, and did not pay attention. She did not see any signs that could worry her and encourage her to undergo a detailed examination. 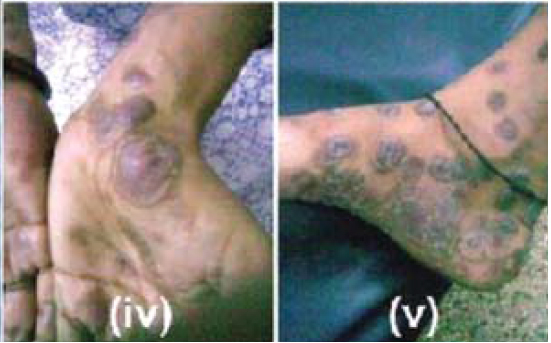 Painless enlargement of lymph nodes, in addition to symmetric skin lesions, typically indicates secondary syphilis. The condition may progress gradually, and 25% of patients are not even aware of it. The patient’s sexual activities in the past are important, and examination may still reveal healing lesions in 15% of the patients. Secretions from secondary skin lesions and hard initial lesions can be used to do a lab-test of the condition, and diagnose syphilis in the primary or secondary stage. Another method that can be used to diagnose the condition is FNAC or lymph node aspiration. Serological tests can confirm early syphilis in patients, with 100% positivity in cases of secondary syphilis. RPR and VDRL are two tests that can be performed to screen syphilis in early stages. These tests can successfully diagnose the condition only after 4-6 weeks of contracting the infection, and do not show results in early or late syphilis. Therefore you cannot rely on these tests to diagnose the condition, but they can be used to monitor a patient’s improvement during and after treatment. In this case, the baby was not exposed to congenital syphilis, yet doctors administered a single dose 50,000 units per kg of benzathine penicillin, as the patient came late without any previous treatment, and there were strong chances of having the disease transmitted. Patients with allergy to penicillin can be treated with alternative medication, which includes oral administration of erythromycin 500mg and tetracycline 500mg 4 times a day for 15 days. This treatment can be effective in patients with early stages of syphilis. But if your syphilis is over 1 year old, then you will have to take penicillin therapy only, followed by desensitization and proper penicillin dosage.